230 pages | 8 B/W Illus. In the past, sport, particularly football, has been defined as a male domain. Women’s interest stereotypically ranges from gentle tolerance to active resistance. But increasingly, women are proudly identifying themselves as supporters of their teams, and have become highly desirable audiences for sport organizations and merchandisers. Football provides a unique site at which to examine the complex interplay between three theoretical areas: identity formation and maintenance, commercialization of cultural practices, and gender hegemony. 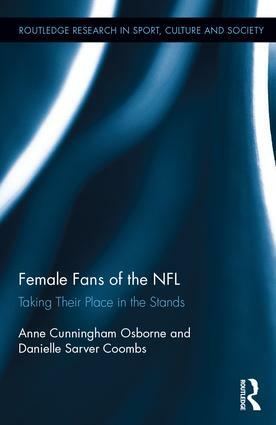 This book explores how women experience their fandom, and what barriers exist for the female fan. 1. Introduction 2. Performative Sport Fandom 3. Knowing and Caring Modes of Fan Performance 4. Challenging the Stereotypes on Their Own Terms 5. A Family Affair 6. Community Ties, Community Pride 7. The Face Paint, Terrible Towels, and Tutus of Public Performances 8. Food, Football, and Fun: Watching at Home 9. Who Do You Think You’re Talking To: NFL Representations of Women 10. Conclusion. Appendix A: Interview Guide. Appendix B: Interview Participants. Anne Cunningham Osborne is Associate Professor in Syracuse University’s S.I. Newhouse School of Public Communications. Danielle Sarver Coombs is Associate Professor in the School of Journalism and Mass Communication at Kent State University.